McKinney ISD MediaLarissa Martinez gives her valedictorian speech during McKinney Boyd High School’s graduation ceremony. 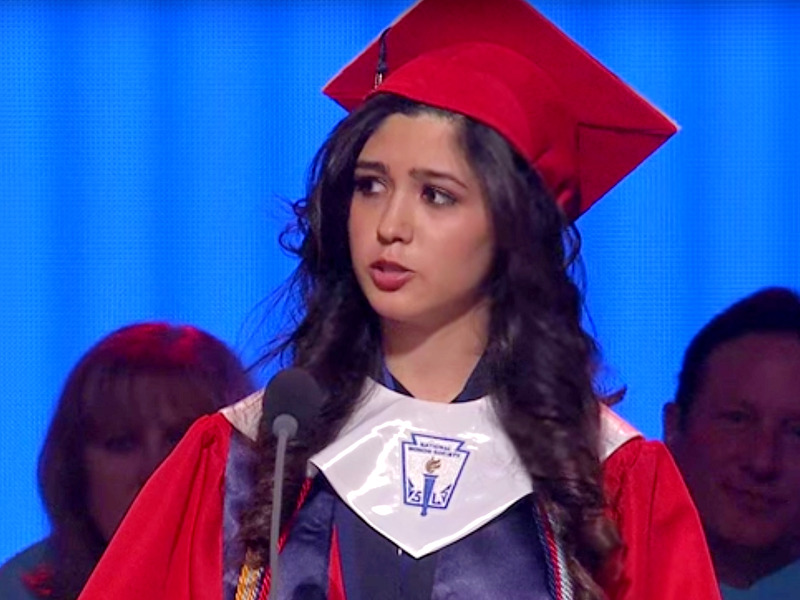 Larissa Martinez graduated last week at the top of her high school class with a 4.95 GPA, earning her a full-ride scholarship to Yale University and the opportunity to speak to a crowd of her peers and educators during her valedictorian speech. Martinez took the opportunity to reveal to the audience, most of whom had no idea, that she was an undocumented immigrant. She also had some choice words aimed at Donald Trump. “The most important part of the debate, and the part most overlooked, is the fact that immigrants, undocumented or otherwise, are people too. People with dreams, aspirations, hopes and loved ones. People like me. People who have become a part of the American society and way of life and who yearn to help make America great again without the construction of a wall based on hatred and prejudice,” Martinez said during McKinney Boyd High School’s graduation ceremony. While Martinez never mentioned the Republican presidential candidate by name, she told WFAA ABC 8 News in Texas that her words were a challenge to Trump and the negative rhetoric surrounding undocumented immigrants. Martinez left behind an abusive and alcoholic father in Mexico city in 2010 and, with her mother and sister, settled on a tourist visa in McKinney, Texas. “We just flew over here with luggage and a lot of dreams,” she told WFAA ABC 8 News. She said she is still waiting for her application for citizenship that she sent in almost seven years ago to be processed. She said that the US immigration system is broken, and that although many immigrants like her “are trying to do it the right way,” they don’t know how. Martinez also challenged the media’s portrayal of undocumented immigrants and asked the audience to look beyond the dehumanising accusations she said some politicians have made. By sharing my story I hope to convince all of you that, if I was able to break every stereotype based on what I’m classified as — Mexican, female, undocumented, first-generation, low-income — then so can you. We do not have to let expectations become our reality. I am no expert in this journey we call life, but I am living proof that beating the system is possible. We do not have to conform to the limitations that others put on us. There will always be people that judge us, and set expectations based on their preconceived ideas of who they think we are and who they think we should be. However, we have the ability to prove them wrong.